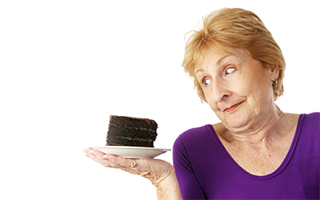 Will a sweet tooth destroy your memory? Juices, desserts, and soft drinks have something in common: They can lead to memory loss even if they don't raise your blood sugar. We know that people with type-2 diabetes may have an increased risk of dementia. Now we're finding that this risk can occur even when blood sugar levels are normal. According to the Mayo Clinic, you're at risk for vascular dementia if you have diabetes because the disease can harm blood vessels in the brain, reducing or blocking the flow of blood. But new research out of Germany suggests that high blood sugar levels can negatively affect your memory even if you don't have diabetes. To support this idea, the researchers tested 143 people. The participants had an average age of 63 and did not have diabetes or pre-diabetes. They also excluded subjects who were overweight, drank more than 3.5 servings of alcohol daily, or already suffered from memory impairments. They then scanned the participants' brains to check the size of their hippocampuses, which is the part of the brain linked to memory, and performed memory tests. Participants with lower blood sugar levels performed better on the memory tests compared to those with higher levels. In particular, participants with low blood sugar remembered more words on a recall test. And the researchers were able to determine that an increase of 7 mmol/mol of the glucose marker HbA1c led to the participants recalling two fewer words. Study author Agnes Flöel explained, "Clinically, even if your blood sugar levels are 'normal,' lower blood sugar levels are better for your brain in the long run with regard to memory functions as well as memory-relevant brain structures like the hippocampus. Scientifically, we were able to shed further light on the mechanisms mediating these effects. DTI-based (diffusion tensor imaging) measurements demonstrated that not only volume or the hippocampus but also microstructural integrity is lower if blood sugar levels are higher." The researchers believe that these findings will help them better understand how chronically elevated blood sugar levels affect the brain, even when a person is not diabetic. They're also hopeful that this research can help in the development of preventative strategies to help people avoid cognitive decline as they age. Dr. Flöel noted that "These findings are important because they indicate that even in healthy non-diabetic, non-impaired glucose tolerant individuals, lifestyle choices that tend to lower blood glucose levels in young and old individuals should be recommended. These include, for example, avoidance of obesity (particularly in mid-life); consuming a diet rich in fibers, vegetables, protein, and whole-grain products; and undertaking physical activity on a regular basis." If you are at risk, particularly if you are obese or over the age of 55, start monitoring your fasting glucose and HbA1c levels. You want to know right away if your levels are becoming elevated so you can make appropriate lifestyle changes before they affect your memory. If you want to protect your memory but your sweet tooth gets in the way, Metabolic Defense can turn down your sugar cravings and make it easier for you to resist sweets. It can also help regulate your blood sugar. Medical News Today, 24 October 2013.